Her voice, talent, and charisma have conspired to produce one of the most impressive track records in the music industry. 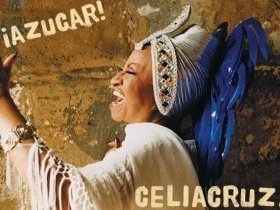 Celia Cruz has received so many distinctions that if we had to list them, they would fill a large volume. It goes without saying that her more than 70 albums have garnered a healthy amount of gold and platinum records, plus more than a hundred awards from prestigious institutions worldwide. She has received Three GRAMMY Awards and Four LATIN GRAMMY Awards. Celia Cruz has received three honorary degrees from the following US universities: Yale, Florida International University, and the University of Miami. She’s also appeared in about 10 movies, with The Mambo Kings and The Perez Family among the most recent. Her first talent award was received in 1947, in her native Havana. Shortly after, she enrolled in the National Music Conservatory, where she studied musical theory, voice, and piano. Soon her music was in demand from the worlds of radio, movies, and television. In the early 50’s se joined the legendary group La Sonora Matancera, and together they wrote some of the most memorable chapters in Afrocuban music. This alliance grew beyond the borders of her native island, and her talent was soon exported throughout the world. On July 15th, 1960, she left her homeland for the United States, where she continued to make history. That decade, she recorded several albums with maestro Tito Puente and together they sparked an interest in salsa among Anglo and European audiences. This phenomenon was known as “the Salsa of the 70’s”. Her collaborations with other maestros, such as Johnny Pacheco, Willy Colón, and la Fania All Stars, are also memorable. It is not exactly clear when they started calling her “The Queen of Salsa”, but she has carried the title with class and distinction. Celia has recorded with some of the biggest names in music: Dionne Warwick, Patti Labelle, David Byrne, Gloria Estefan, Wyclef Jean. Because her talent transcends generations and tastes, she has also performed with rock groups such as the Fabulous Cadillacs and Jarabe de Palo. She has been honored with stars and street sections in some of the world’s most visited avenues. In 1987, Hollywood bestowed on her a star in the Walk of Fame. Years later, Miami’s Calle Ocho was named “Celia Cruz Way”, and in 1991, that city also presented her with a star; an honor that she as also received in other celebrity sidewalks, such as the one in San José, Costa Rica, and the Plaza Galería, in Mexico City. Although she’s received many distinctions, the 90’s have marked a very special period in her career. In this decade, the Smithsonian Institution gave her a Lifetime Achievement Award, the Republic of Colombia awarded her the Presidential Medal in Arts, she received the prestigious Lifetime Achievement Awards from the Hispanic Heritage Awards, and the City of San Francisco declared October 25th, 1997 as “Celia Cruz’s Day”, to name a few. But undoubtedly, one of the most memorable moments in her life was in 1994, when in the White House she received from the President of the United States, Bill Clinton, the highest honor this country bestows an artist: the National Endowment for the Arts. Although she had received several distinctions in this newly started millennium, the happiest “Guarachera” in the world has already been rewarded with some of the music world’s top honors. In 2000, the prestigious magazine Billboard (considered “the Bible” of the industry) paid her a special tribute for her 50 year career. That year, she also won the first Latin Grammy for the best tropical music record. The year 2001 has continued the awards tradition, and she’s not only been nominated for another Latin Grammy, but she entered the Walk of Fame at the Jackie Gleason Theater of The Performing Arts in Miami Beach. Her fame and friendliness are a magnet that attracted fans of many different languages, something that was more than confirmed when she sang “Guantanamera” along with Luciano Pavarotti in the traditional benefit that the illustrious tenor holds every year in Italy. Just a few days before, Celia had sung in the memorable concert: “VH1 Divas Live: The One and Only Aretha Franklin”. In spite of all her talent and the awards she has received, Celia Cruz is incredibly down to earth and her happiness is contagious. These are the traits she’s used to write one of the most important chapters in the history of Afrocuban and world music. It’s enough to mention Celia’s name to have people’s spirits fill with joy and their hearts with music. That’s because she is the highest representative of this musical genre, and the most notable ambassador of Hispanic culture in the world.